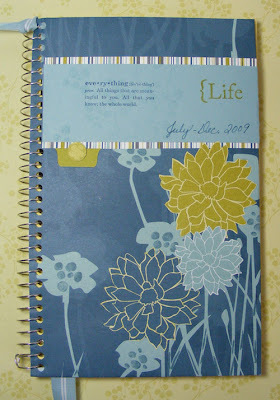 Lisa E Design Blog: New Month, New Notebook, NEW CATALOG! It's time for a new notebook. I've filled up my last one with everyday stuff from January to June - lists, ideas, appointments, cryptic little sketches, phone numbers that I invariably fail to label, etc. In short, these little notebooks contain my day to day life. I purchase the notebooks from Office Max. They are Cambridge brand by Mead and have yellow ruled paper on one side and gridded paper on the other. I have created a link at right for a link to the catalog. It isn't quite ready yet on the Stampin' Up! site but I'll post the link as soon as they have it on-line.